War, famine, natural disaster, alien invasion, robots, and zombies have all made appearances in our post-apocalyptic stories—and sometimes these horrors overlap. The genre can substitute any of them without much trouble so long as it does not erase their shared message. At the core of post-apocalyptic literature and film is the theme of hope. Hope that no, this is not the end. There is more. We will rebuild it. These goals tend to ignore that “starting over” is a cyclical thing to hope for and that humankind is doomed to repeat its mistakes once it reaches its next apocalyptic turning point. The struggle perpetuates itself through never breaking the cycle—through putting our hope in the next generation, as if they will get it right the next time. This is when the theme of “hope” becomes synonymous with “children” (think The Handmaid’s Tale, Children of Men, Terminator). These comforting glimmers of this hope—of children who will supposedly make our struggles worthwhile—are actually self-serving and potentially damaging to the Other and ourselves. This hope narcissistically assumes that humans are the ultimate species—seeking to maintain the status quo and undermine betterment (even for ourselves) with its fixations on purity and conservation. It ignores the fact that, just because the human era is dwindling, it does not mean our story and legacy are ending. If our post-apocalyptic stories are contingent on propagating the human species, despite ourselves and our abilities, we risk promoting suffering for the sake of suffering. 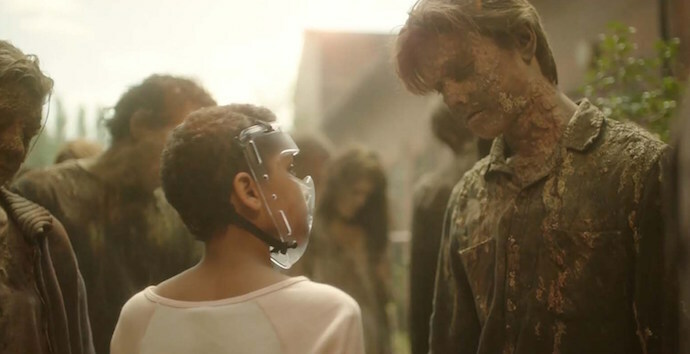 The best circumventing of this “hope trope” I have seen recently is in the 2016 film based on the book of the same title, The Girl with All the Gifts, where hybrid zombie-human children, whose reproductive status is moot, are the future. Not humans themselves. Like Planet of the Apes, this 2016 film is about the end of humans and the planting of a new species—pun intended. It is a story in which humans leave behind a new hybrid species not thought of as human. These children (the new generation) are not susceptible to the zombie-fungus that regular humans are. Essentially, they are half-zombie, half-human. I refuse to call this generation “hungries,” as the zombies are called in the film, since this denies them their hybrid nature. It is arguable that the not-yet-infected “old” generation (read: non-zombie humans) has held civilization back. They struggle to survive and cause suffering when doing so—going so far as to experiment on the second generation children to find a “cure” for the fungus which causes the zombie symptoms. The children are the answer, but they are not the pro-natalist answer. It is unclear (as far as I can remember) where the zombie-fungus came from. If created by humankind, it did not seem like it was created to enhance humans in anyway. The captive zombie-human children weren’t created purposefully or accidentally by this plight. They were created naturally. There is no “humans playing God” scenario being enacted, as seen in many of our other apocalyptic stories like Planet of the Apes or Terminator. The fungus is treated more like a natural disaster—like global warming or the loss of resources due to overpopulation. The thought never occurs to the older generation that these children are how civilization adapts and evolves. They see them too much like the Other—as unhuman. Instead of trying to fit into the new reality, humans try to bend reality to fit with their structures and systems—to their downfall. 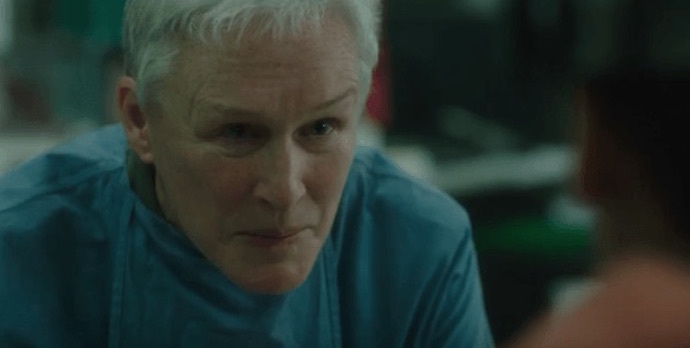 Dr. Glenn Close, trying to convince a child to give up her brain to help old people. It may seem a stretch to claim that The Girl With All The Gifts is an anti-natalist story when its most pro-natalist characters aren’t necessarily pro-baby, but pro-species. The logic behind both, however, stems from the same selfish and oppressive choices. Humans, until this point, have treated the new, immune second generation like just another thing to be colonized to secure their own posterity. They subject the children to captivity and dissection. This is all done in search for an antidote so that the old generation of humans can keep on living and therefore breeding. It is never in the interest of the new generation/Other. It is here I would like to emphasize natalist vs. pro-natalist. Pro-natalism goes beyond the status quo of humans’ natalist tendencies to promote a birthrate without reason or through ignoring ethical critique. The main character, Melanie, of the new generation, questions the doctor wanting to kill and use her for scientific inquiry: Why should they die to help a species that is so selfish? Though Dr. Caldwell is dying (not of the fungus, but of a wound infection), she still wants to continue her pro-natalist agenda for a cure that is unlikely to save or better life for the greater good. The search for the cure, therefore, is not even about saving her own life (the search is what endangered her and her colleagues, killing most), it is about her unhealthy fixation on destroying the Other. Dr. Caldwell, too focused on her own species and the purity of human DNA, cannot see how the theoretical cure has harmed her. Melanie kills her to end suffering for both parties. Melanie also traps Helen, much like the children had been trapped, for Helen’s protection from the now-airborne fungus. Captivity, in this instance, is an exhibit of anti-colonialism (colonialism being a symptom of pro-natalist fixations). Stick the colonizer in captivity for true safety. Seen in parallel to the colonizing system of zoos, which, in their early days, exhibited humans from around the world like freak shows, it sheds light on the horror of ourselves: we are the creatures experiencing habitat loss. We are stuck in the cage for the excuse of “conservation.” It is even more ironic when we realize that Helen is saved to educate the children—offering the very “educational experience” zoos claim to offer. There lies the true horror of the film—the bittersweet contrivance of the sole situation where oppression is moral. And Helen accepts her fate and her purpose; her human story is not ending. Her hope was in a world where both species could co-exist. And, even though she is the last of her kind, she has achieved just that and gotten to live. Keeping the last human on earth “safe” means subjecting her to a reverse captivity. Perhaps the only true way captivity keeps anything safe is putting the colonizer in a cage. Yes, one could argue that rooting for the children to live and thrive is still pro-natalist—the children are, in fact, half-human and carrying on the species in some fashion. But we do not know if they will carry on in the same fashion as the human generations have. Hell, we aren’t even sure how they can reproduce or if they need to reproduce at all, as they may have all the seemingly-immortal benefits of their zombie counterparts. Are they, since they are half fungus, even sexual in the same way as humans? If they chewed their way out of their mothers, is it a good idea for them to entertain the same fate? Will they exploit the earth in the same way that humans have? They clearly do not wish to exterminate the Other in the same mode as humans, leading us to hope that they are different. Their thirst for blood is perhaps the only troubling “moral wrinkle” needing smoothed out. The fact that M.R. Carey’s follow up to The Girl With All The Gifts is a prequel and not a sequel reinforces the human era is finalized. But the human story does not stop with Helen (who, ironically, tells myths and legends to the second generation children—soon what humans will become to the world). Our stories do not have to be total anti-natalism, but they should address pro-natalism and its Othering symptoms on our culture and future. This is what makes The Girl With All The Gifts so original and its message so necessary for future stories: If we are going to survive, we must embrace the Other. This essay was adapted from previous posts originally published on Further Annotations.